An impressive, unique, outstanding shrimp cocktail with grapes, fresh tomato bits and other ingredients, tossed in our secret blush dressing, elegantly presented in a martini glass. 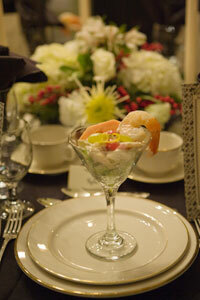 Chef Blažena’s LA twist on the traditional, ubiquitous shrimp cocktail, as it was served at the Golden Globe Awards ceremony dinner. Go for a new culinary adventure and experience! You will delight in every bite! 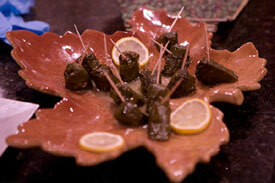 Try these outstanding morsels of wine leaves filled with rice and herbs, drizzled with lemon. 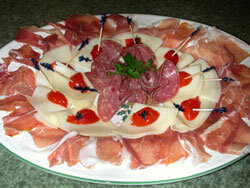 Great bar snack and hors d'oeuvre any time of the year. 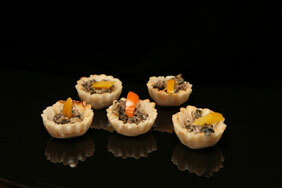 Absolutely delectable, served in the Russian tradition with a dollop of herbed sour cream, dill and capers. 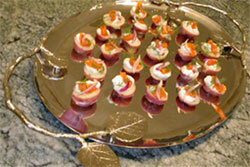 Their distinctive taste provide an interesting starter anytime. Pending your budget, topped with a few grains of caviar. Fabulous CAPONATA version also available. 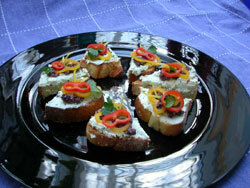 Open faced canapés. 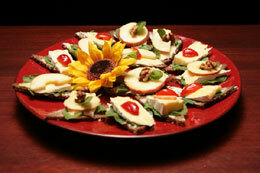 Dark European multi-grain bread layered with Brie, sweet crunchy apples, pears or apricots (in season), balanced with tangy Arugula. 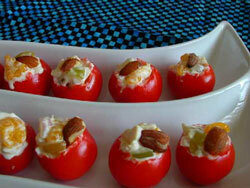 Garnished with a selection from red grapes, exotic Peppadew or walnuts. 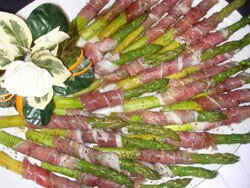 Crunchy spears wrapped in Prosciutto, laced with white balsamic vinaigrette. 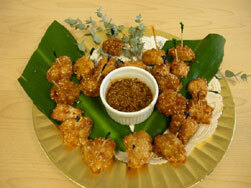 A delectable twist on the popular and traditional appetizer. With Mozzarella, the uniquely tasting Peppa-Dew and Genoa Salami. 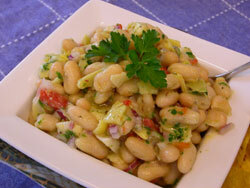 Absolutely delicious signature recipe, bursting with the flavors of the Mediterranean. Served with assorted tortilla chips or in tortilla "baskets".